Winter in Finland can be quite cold with temperatures going down to minus 25-30°c. In the south of Finland where I live the temperature tends not to be so cold but can still easily be more than -15°c. These low temperatures mean that protecting the outdoor bonsai during this period can be a challenge. I have a garage where I place the deciduous trees that will protect them from the frost and the cold wind, which is one of the main culprits for killing the tree because the wind can dehydrate the tree during this period of dormancy, but this does not protect them from the really cold temperatures. The garage already keeps the temperature a few degrees higher than the outside temperature and in general temperatures down to -10°c are ok but anything more than -10°c it is advisable to provide some extra protection. The garage has electric floor heating installed but this costs a fortune to keep on, as I found out to my horror last year when the electric bill arrived, so this year I thought I would build a small heater bed for the trees to sit on that I can put on when needed without costing a fortune. The heater bed consists of a wooden frame with a thermal insulation base on top of which are two layers of sand. Sandwiched between the layers of sand is a heater cable attached to a metal grid. 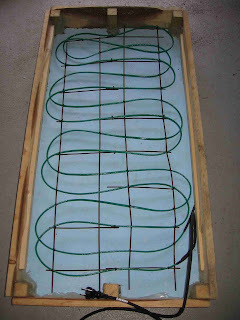 The following photos show the step by step build of the heater bed. A wooden frame was made as shown in the image below. The size of the frame was approx 120x60cm. 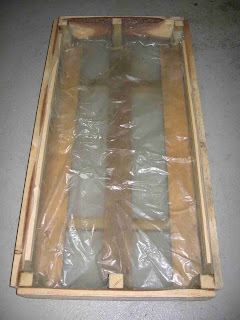 The width of the frame matched the width of the thermal insulation material I would use. 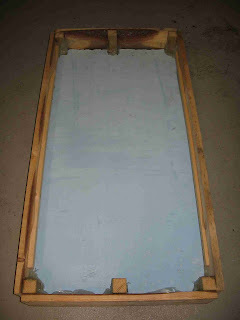 I attached a large sheet of plastic to the sides and bottom to help to retain the sand from falling through. On top of the sheet of plastic I placed a piece of thermal insulation material. This material is about 4cm thick and very stiff. I could of used some type of board to form a firm base to hold the sand but this is what I had available and I thought it would help in maintaining some of the heat. The heating cable, which can be obtained from a local electrical shop, is specially designed to be used outside and for keeping things warm. Normal use of this cable is to warm water pipes, either the main water coming into a house or attached to drain pipes to prevent the water from freezing during the winter. The temperature output of the cable is approximately 10°c and uses 10 watts per metre. The length of cable I have used is 10m meaning that the power consumption is 100 watts. The cable is attached to a metal grid the size of the area with cable ties. I attached the cable on both sides of the metal grid at equal distances to try to get an even distribution of the heat. The cable is already fitted with a standard electrical plug as seen in the bottom of the image. The finished cable was taken out of the frame and a layer of sand approximately 2-3cm deep was added on top of the thermal insulation material. I then placed the cable on top of the sand and then proceeded to add more sand to cover the cable. I was not sure how much sand I needed so I started with another 2-3cm. The reason I wasn’t sure how much sand to add on top of cable was because I didn’t know how warm the sand would get when there was power to the cable. I wanted the sand to get warm but not to too warm and even though the temperature output was only 10°c the fact that I had looped the cable close together meant that the combined temperature could be more than that. As it turned out the difference between the ambient temperature and the temperature at the top of the sand was about 10°c. Because I am planning to use this heater bed only when the temperature is really cold the sand will never get above the magic temperature of +10°c, temperature that would start to represent that spring was here, so this difference is fine. If the temperature had been too high I would have simply added more sand to absorb more of the heat. In the image below you can see a thermostat to the left hand side. The thermostat takes the ambient temperature and a sensor, normally used to take the outside temperature, is inserted at the top of the sand to give some indication of the temperature of the sand. We have been blessed that during November and the beginning of December the temperature had been quite warm for this time of year with temperatures even reaching +8°c on some days. But as can easily be the case here in Finland the winds change direction and we go from +2°c to –12°c overnight. This happen one night a couple of weeks ago and then that was the time to move the trees inside the garage and on to the heater bed. I didn’t actually turn the heater bed on because the garage was protecting the trees from the frost and the ambient temperature was only -6°c. Winter really started to come after this day with daily temperatures of –10°c to –16°c. During one of these days I turned on the heater bed as the temperature inside the garage was now –9°c. The out come was that the sand warmed to a nice temperature of +2°c. Perfect to keep the toes (roots) warm of my small collection of bonsai (potensai). Thank you for sharing this excellent guide on how to build a winter nest for bonsai. I will certainly try this next autumn. My experience is that trees tend to tolerate more than what one read about on the internet. But of course, with temperatures over -25 C over a longer period, the risk is obvious. Here in western Norway the temperature seldom drops below -15 C, and I havent lost a tree yet. However I have a Seed project going on this spring, so I will make a box like yours to ensure they live to see 2011. Do you have a way of measuring/regulating the temperature of the box contents during the cold winter? 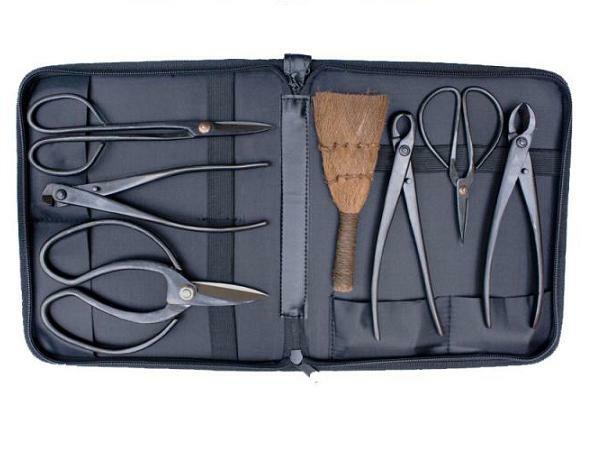 I am pleased that somebody else finds this useful. As you said at -15 C is maybe not a problem especially if you able to cover them with some snow. Walter Pall (read his adventures from the link on the right hand side) also experiences temperatures around this and nearly all his 1000 trees are outside during the winter. 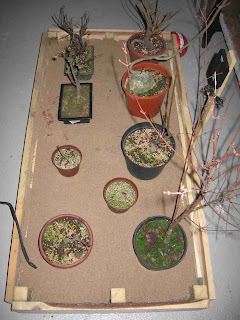 Maybe when I have more trees I will have to be a bit more selective which ones go on the heater bed. To answer your question I don't have a good way to regulate the temperature. I measure the ambient and sand surface with a simple digital indoor / outdoor temperature gauge. 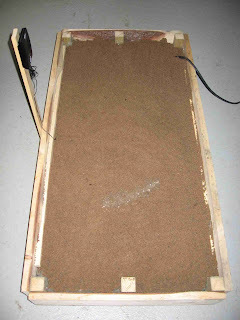 It seems that the amount of sand that I used was enough so that when the heater was on the temperature increased by about 8 C. Adding or removing sand will affect the amount of temperature change.